In my last blog post, I looked at the four quadrants of research data curation systems. 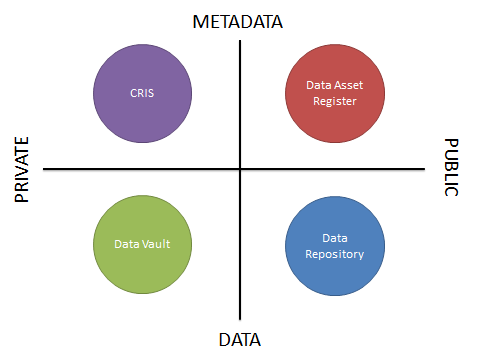 This categorised systems that manage or describe research data assets by whether their primary role is to store metadata or data, and whether the information is for private or public use. Four systems were then put into these quadrants. The University of Edinburgh already has two active services from this diagram: PURE, our Current Research Information System and DataShare, our open data repository. 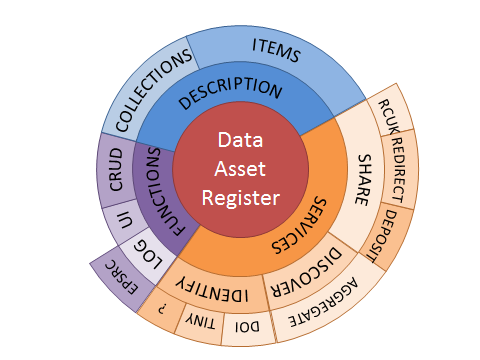 This blog post will start to unpack some of the requirements for a Data Asset Register. The first aspect to cover is its name. What should it be called? Traditionally systems like this, which only hold metadata records that either just describe, or describe and point to other resources, are known as registers, catalogues, directories, indexes, or inventories. The University already has a ‘Data Catalogue’, maintained by the Data Library. However this list has a different purpose, to hold details of external data. Oxford University, instead of opting for a name such as this, have instead opted to call their service by the verb ‘find’ – DataFinder. Whilst there may be some brand or service name applied to the system we create at the University of Edinburgh, for now its working title is ‘Data Asset Register’ as one of its main functions will be to allow data creators to ‘register’ their data assets by describing them, and if the data is published online to link to the data. The core purpose of the system is to describe data. This is split into two categories: being able to describe single items or data assets, and describing collections of data assets. Many data assets are created on their own, for example a population health longitudinal study. As such, this should be described on its own. In contrast, some data are created in large sets, where it isn’t necessarily useful to describe every part of that set on its own. In this case, the collection as a whole can be described. A good example of this is the Research Data Australia service from the Australian National Data Service. We’ll need to decide how to describe the data. A likely initial candidate will be the DataCite Metadata Schema, but we may find this needs to be extended to cover extra elements relevant to the University or the discipline of the data asset being described. There will also be requirements coming from a possible UK research data registry, development of which is being led by the Digital Curation Centre. CRUD: Create / Read / Update / Delete are the basic functions required when manipulating data. The system should allow records of research data to be created, read later, updated, and if needed, deleted. User Interface (UI): In order to enable CRUD functionality, a user interface will be required. To be useful, this will need to provide search and display functionality, for example using faceted search and browse. It may also be that the Data Asset Register can be a front-end for our Data Vault too – more about that in another blog post! Identify: The ability to assign identifiers to data assets. Some of these identifiers will need to be persistent. DOI: DataCite DOIs allow DOIs to be assigned to data assets, in the same way that DOIs are assigned to journal articles. This allows them to be persistently identified over time even if they move between systems, but also allow them to be cited using a well-known identifier. TinyURL: A short URL such as those provided by TinyURL or bitly are useful to give easy web identifiers to objects. For example it might be nice to be able to issue URLs such as http://data.ed.ac.uk/abcd. Other: Are there any other identifier systems that we should consider using? Discover: It is important that the data records held in the Data Asset Register are searchable and can be indexed by external services. This may be by national, international, or discipline-based data aggregators, or by normal web search engines. Deposit: If the data is held in the Data Vault, along with a description in the Data Asset Register, then using a deposit protocol such as SWORD it would be possible to deposit the data into the institutional data repository, or into an external repository. The Data Asset Register can then record the identifier for the hosted data set. Redirect: Where the data is hosted online elsewhere, the Data Asset Register could automatically redirect users. For example visiting http://data.ed.ac.uk/abcd could redirect a visitor directly to the repository, rather than showing them just the data asset record description. If the data is not shared openly, then contact details can be provided of the data owner. It is very early days in our thinking about what features a Data Asset Register should offer, and like many components of a modern research data management infrastructure, there are very few existing examples to look at. Our thoughts will be refined over the coming months so that we can start looking at implementation options. Is there an existing system that can do all of this for us, or is it better to build something new, either alone or with collaborators? Stuart Lewis, Head of Research and Learning Services, Library & University Collections.